Since 1966, the South Jersey Region of the Antique Automobile Club of America membership has been committed to sharing our vehicles with the public. It is our goal to see that our classic automobiles are “out and about” at local events for the public to see and enjoy. Once each year, the SJR participates in the Harvest Fest car show in Elmer, NJ, where Lew Zane, a past South Jersey Region president, instituted a car show that included antiques, classics, motorcycles as well as military vehicles. We also run two cruise nights a month from April through September. We have partnered with Bobbitt Auto, Salem, New Jersey, for our 3rd Wednesday of the month cruise night. Our other cruise night is at the Kountry Kitchen Restaurant in Pittsgrove, New Jersey, where they offer special dinner pricing for those bringing out their antique automobile. Both cruise flyers are posted on our website under Club Events. The 83rd Annual AACA meeting was held from February 7th – 9th in Philadelphia, PA. and the South Jersey Region AACA was well represented. CLICK HERE TO READ MORE. This 1931 Ford Victoria is one of the club’s most cherished cars, originally restored by Al Sharp, first President of SJRAACA. Al’s wife, Verna Locke, is still a member and the car is still owned by members Jim and Betty Christos. Our region is always enthusiastically attracting new members. You need not have a classic vehicle to join but simply be interested in the automobile and its heritage. Our membership covers many generations and we include our AACA Junior Members in events in the hope that they will continue to keep the love of our classics alive. Our club attends many parades, travels to nursing homes and participates in many other auto events in and out of New Jersey. We donate to the AACA Museum and the AACA Library & Research Center. We have over 100 members and hope to continue the growth of our region. If you are interested in joining or have a question, please contact us and we will do our best to find an answer to your question. 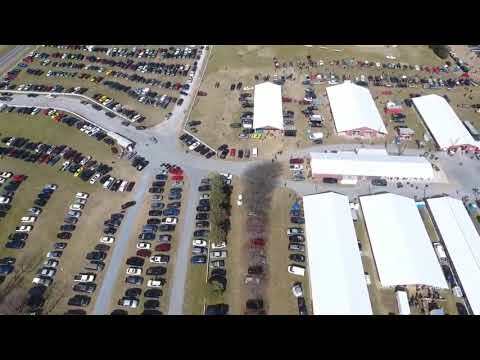 This annual event is held at the Salem County Fairgrounds on the 4th Sunday in March. It’s the biggest one day swap meet on the east coast, drawing thousands of shoppers and hundreds of vendors each year. It’s been held each year for roughly half a century! If you’re a shopper searching for that illusive part, this is must-attend event! If you’re a vendor, then this is the event you don’t want to miss as many of our vendors have happily been coming back year after year. Each October our club participates in a “Toys for Tots” Cruise Event at Bobbitt Auto. We ask both spectators and those who bring out their antique vehicles to contribute a new unwrapped toy to benefit the “Marine Toys for Tots Foundation”.